Petswelcome.com / Articles / Why Not Try a Pet Friendly Extended Stay Hotel? Thinking of taking a long trip with your pet? Then you should consider staying at a pet friendly extended stay hotel (which is a type of hotel, not a specific brand). Typically, these hotels offer bedroom suites, fully equipped kitchens, on-site laundry facilities, business centers, weekly housekeeping and exercise facilities–amenities intended to make your longer stay as convenient and comfortable as possible. Extended stays are often the choice of people who are relocating, or have a job that requires long trips away from home, or for large families that travel together and prefer the space and convenience these hotels offer. However, you might even consider them for shorter trips. At petswelcome, we like to think outside the box and optimize our trips in a way that works for our whole family, even if it doesn’t necessarily fit the expressed purpose of the hotel. That’s why a pet friendly extended stay hotel is a great option, whether we’re staying for a couple of days or a month. There are a lot of advantages to staying at an extended stay with a pet. First, their well-appointed kitchens give you the option of not having to go to a restaurant for every meal. This is huge when you’ve got your dog and/or cat along. Instead of leaving them alone or having to find pet-friendly restaurants (not an easy task, especially when the weather is bad), you can just stay in, cook a meal and enjoy their company just like you would at home. Another great thing about long-stay hotels is that many of them are suites, so your pets can roam about more freely and even sneak off to another room. This makes it easier for them to adjust to the new environment because it is less confining and feels more like a home or apartment than a typical hotel room. Pets like the familiar, so if you can ease the transition for your pet when you are traveling, your trip is guaranteed to be more successful. 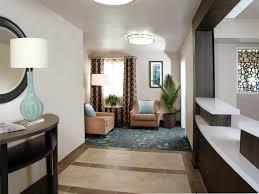 An interior shot of an extended stay hotel. Candlewood Suites offers full kitchens stocked with utensils in every suite. There is also a free guest laundry, gym facilities and, best of all when the weather is fine, a gazebo grill to cook up some burgers and hotdogs. Our kind of place! They accept pets up to 80 lbs. with a pet fee of $75 for up to six nights, and $150 for seven nights or more. With over 600 properties, Extended Stay America is a great choice for your next trip. They offer full kitchens, wireless internet and on-site laundry. A maximum of two pets are allowed in each suite with a $25 per day fee per pet for the first month (not to exceed $150 per pet). After the first month there is a $10 fee per day for the first five days of each month. MainStay Suites offers apartment style living with all the benefits you get when staying at a hotel. Whether it’s business or leisure travel, they are a great option if you want a place that offers you great amenities (spacious one-bedroom suites, high-speed internet, weekly housekeeping service, and guest laundry) but still want the ambiance of home. Their pet policies vary from property to property, so check petswelcome’s individual listing to see the policy of the one you are considering. Pet-friendly Residence Inns have the feel of, well, a residence. This includes large rooms that have separate living and working areas, as well as fully equipped kitchens, and complimentary hot breakfasts. Residence Inn pet policies vary from property to property with regard to pet fees and weight limits so check each hotel’s specific policy before making a reservation. 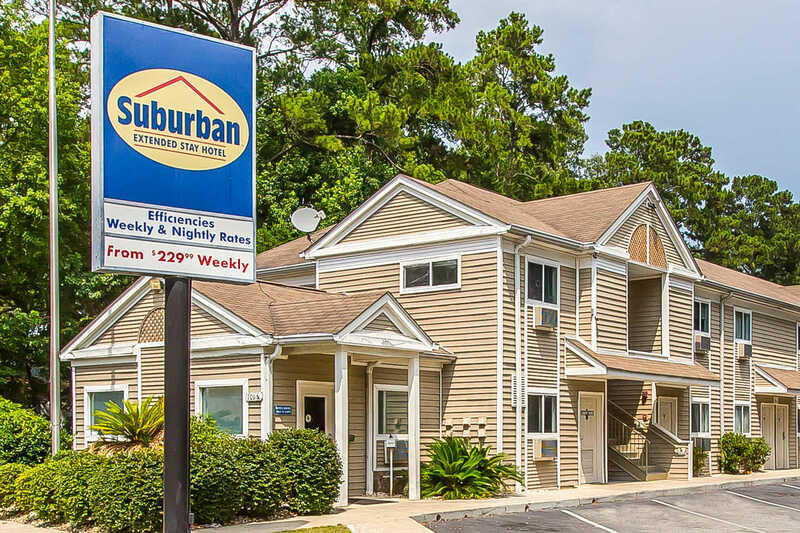 Spacious rooms, well-equipped kitchens, on-site self-laundry facilities, data ports, and outdoor barbecues are some of the amenities you will find at pet-friendly Staybridge Suites. They accept dogs up to 80 lbs. with a pet fee of $75 for up to six nights or $150 for more than seven nights. Studio 6 is and affordable choice for extended stay lodgings. With low weekly rates for furnished studios, you can’t do better than Studio 6 if economy and comfort are what you’re looking for. Studio 6 accepts up to two pets with a $10 nightly fee up to a maximum of $75 per stay. Pet-friendly Suburban Stay offers studio suites with all the conveniences you and your pet will need, whether you’re staying for a night or a month. Fully equipped kitchens, premium cable TV and weekly housekeeping service are part of the package. Their pet policies vary from property to property, so check petswelcome’s Suburban Extended Stay listings to find the policy of one located at your intended destination.